Monday already?? Geesh this weekend flew right by us again...with the exception of having a little stomach bug & feeling kinda icky Friday & Saturday, Sunday was amazing!! We celebrated our dads' with smoking some meat, lots of lotto tickets & selfie stick picture taking ha-ha! While I was outside I decided to grab my camera & blog this nifty little idea to cover/camouflage the ugly umbrella hole/post!! Keep reading below to see how I pulled this together in less then 20 minutes! Start with what you want to fill the basket, box, crate etc.. with! I just used some vintage junk I had laying around & some faux greenery & flowers! I got this little crate as a free gift from our bank. I've used it in various spots in our house, but thought with a little quick stain it would be perfect for this little DIY!! We removed the bottom to use on the table & it worked perfect! Then just simply fill with whatever you like! I love that it takes away from the not so cute hole/ post! Sometimes the simplest DIY projects turn out to be my fav! 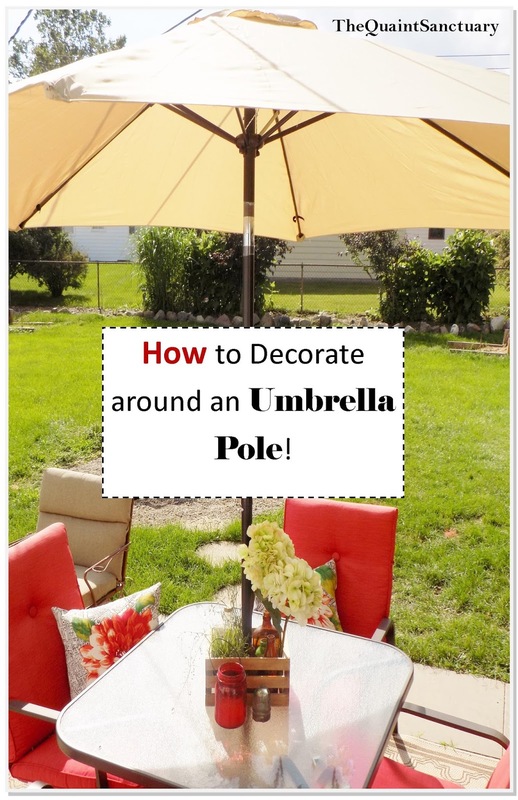 I have to say though my hubby actually came up with this little DIY/crate/umbrella idea!! I love the vintage garden-ish feel of this decorative outdoor centerpiece! The little red mason jar is a citronella candle & the glass electric insulator just looked cute hehe! Have a great week everyone! I'll be back later in the week with a super cute & functional must have summer DIY for every family ;)!